For Sale by Equipment Recycle is a. The Garaventa Evacu-Trac CD7 provides safe, reliable and fast emergency evacuation. The Evacu-Trac should be kept in any multi-story building where persons with disabilities live, work, or visit. In the event of a fire, bomb threat or other emergency, elevators should not be used for emergency evacuation of a building. In this situation, people with disabilities may be trapped or have to wait for a long time in an area of refuge. The Evacu-Trac has been engineered and rigorously tested to meet the most rigorous demands of an emergency evacuation chair. Easy to Set Up and Load Passenger into the Emergency Evacuation Chair The Garaventa Evacu-Trac is lightweight, compact and sets up in seconds. The open sides of the Evacu-Trac are designed for ease of transfer from a wheelchair. This can often be done without assistance. Once the passenger is positioned in the Evacu-Trac, Velcro straps are wrapped securely around the passenger's torso and lower legs. The passenger is then wheeled to the stairway for descent. Failsafe Brake and Speed Governor Control the Descent The Evacu-Trac is completely stable and self-supporting on flat surfaces and on the stairs. Its patented speed governor and braking system allow a small attendant to easily evacuate a larger person securely and maintain full control of the speed of descent. The durable rubber tracks firmly grip the stairs and the safety brake can stop the unit on the stairs if necessary. The Evacu-Trac is equipped with a sling seat, three safety straps and a deep foot pocket for passenger safety and comfort. Evacu-Trac Dimensions Capacity: 136kgs/300lbs Speed: 1.1m(3.6ft)/sec Stair Angle: 40° Max. The chair is new, there are some scratches on the cabinet. Here is your chance to own this for a fraction of retail! We are here to help! We believe that we can sell anything and there is no job or product to big. Let us sell your equipment and help you or your company grow. There is a large customer base out there just waiting to be reached and Equipment Recycle is the company to reach them for you. Let Equipment Recycle bring the world to you! Buyers without these will be subject to a lift gate charge. The sale of this item may be subject to regulation by the Food and Drug Administration and state and local regulatory agencies. Equipment Recycle is the consignee of most of the items we sell. Equipment Recycle has used its best efforts to inspect the item(s) for sale and create descriptions and furnish photographs that fairly and adequately depict the type, condition and image of the goods at the time of sale. Powered by SixBit's eCommerce Solution. 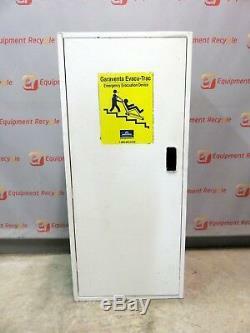 The item "Garaventa Evau-Trac Emergency Evacuation Device Stair Storage Cabinet 300lb CD7" is in sale since Wednesday, May 23, 2018. This item is in the category "Business & Industrial\Healthcare, Lab & Dental\Medical, Lab & Caregiving Furniture\Other Medical, Lab & Caregiving Furniture".